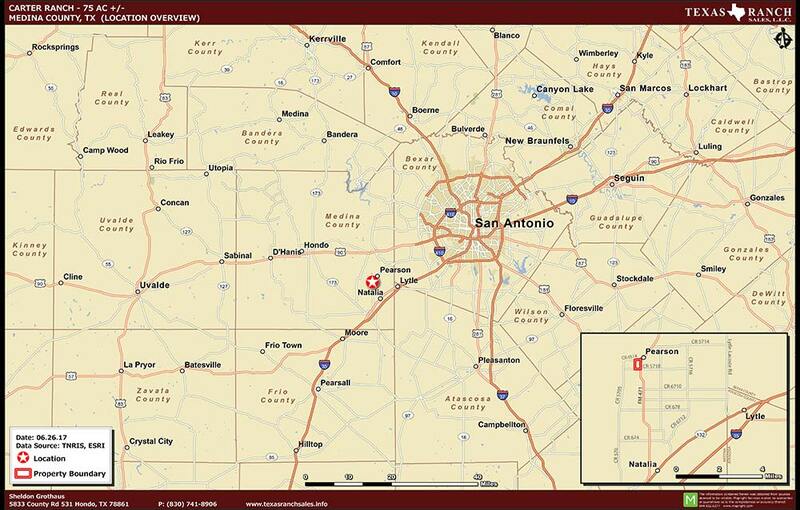 Located 7 miles south of Castroville and 5 miles South of LaCoste on the west side of FM 471 South in Medina County and Medina Valley ISD. The land is flat to gently rolling and is currently in commercial coastal Bermuda hay production. The entire acreage is included in the B.M.A. Irrigation District. Entry to the ranch homestead is from FM 471 S. and the ranch borders County Rd. 4515 on the north and County Rd. 5718W on the south. There are accessory entry gates on all three roads. Soils on the ranch are deep and fertile clay loam types supporting an excellent stand of coastal Bermuda grass. The acreage is irrigated via the water rights with the BMA Irrigation District which convey with the land. The north half is irrigated via a three tower Valley pivot which is supported by the one acre lake which is filled with irrigation water. The south half is flood irrigated using the BMA canals and gated irrigation pipe. The homestead has two rural water meters with the East Medina Water District which serve the main home, guest house and stable. 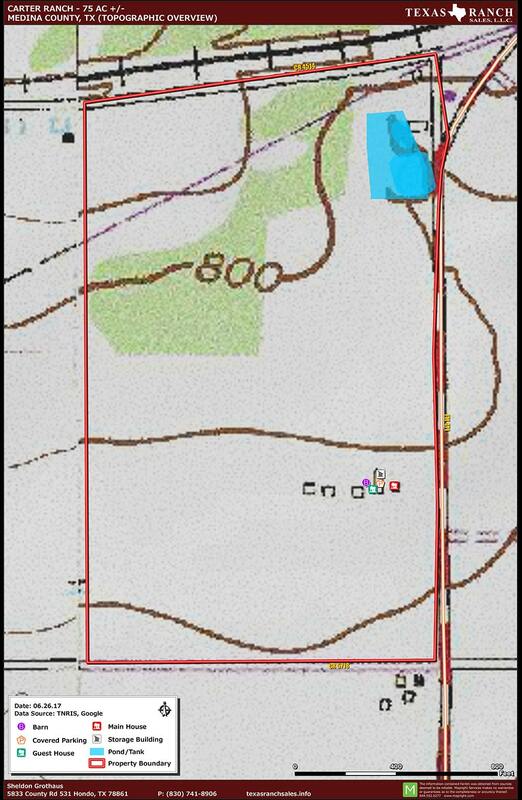 There is a water well located in the southeast corner of the property. It is currently not equipped with a pump. The fields on this ranch and nearby crop farms support many quail and doves and Whitetail deer are often seen in the area. The one acre lake on the ranch is stocked with Bass, Catfish and Bluegill. Entry to the homestead is through an automatic electric gate on FM 471S along a newly concrete paved drive that leads to a 1600 SF 3 bedroom, 2 bath newly remodeled home and a 1 bedroom 1 bath guest house. A two car carport, storage room and underground storm shelter are located between the main home and guest house. A one horse stable (or shelter for any 4-H project) is located behind this homestead compound. The stable has a new pipe pen with water trough and a tack room with roll up door. The entire fence surrounding the residential compound is attractive pipe and chain link and laid in a concrete curbing. Both homes in the compound have been extensively remodeled and in pristine condition, and not occupied since being remodeled. The lawns are irrigated and manicured. The ranch perimeter fence is 5 strand barbed in good condition to hold livestock. There are three CPS Energy electric meters on the ranch. The ranch has a 3-tower Valley center pivot, two irrigation pump motors, 1600 ft of gated irrigation pipe with 490 gates, which may be purchased separately. Seller will convey one third of the owned mineral estate with the sale of the ranch.. 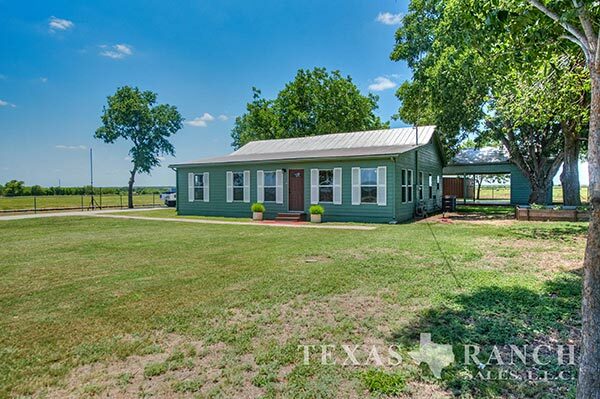 This Ag exempt ranch is the perfect size for those seeking a self sustaining country estate for agricultural and recreational interests, yet close to all the conveniences of nearby Castroville, LaCoste and San Antonio. Medina Valley School bus stops at the ranch gate. The homes are in like new condition and ready for move in. Part of this ranch could be reserved for hay production while part could be used for the agricultural crop or animal interests such as cattle, horses, or any of the many 4-H projects. Besides a terrific location convenient to all shopping, schools, dining and medical services, having both mineral and water rights is a rare and valuable find. Combined, these features make this ranch an exceptional country estate and family homestead.